Fade in. The sequel begins. After ruling Ramgarh for over sixty years, Thakur Balwant Singh is now complacent and arrogant. As it happens, decades of unchallenged power can be intoxicating. Once prosperous, the people of Ramgarh are suffering as Thakur’s men are busy looting coal, spectrum and the aam villager. His haveli in Lutyens’ Ramgarh is only for sycophants who sing paeans in his praise. Dour and uncommunicative, Thakur does not speak. When he speaks, it is to defend the indefensible. His silence seems a better option.Those close to Thakur, seek refuge in belligerence. Moreover, an aging Thakur is not in touch with Ramgarh’s changing demography. As a result, Thakur anoints Chote Thakur as the caretaker of Ramgarh. But the villagers have had enough of Thakur and his family.They laugh when Thakur says, "Thakur Ka Haath, Aam Admi Ke Saath." For they know that Thakur lost his hands after 2009. There are scenes where Ramgarh-wallas ask in hushed tones, “Why is Chote Thakur so precisely the opposite of his predecessors?” The answer eludes everyone - including the reluctant Chote Thakur." Meanwhile challenge comes in the form of Babbar from Gujarat. Far away from Ramgarh, in his small village, Babbar is the new face of governance. His name is synonymous with development, literacy and empowerment. When residents of Ramgarh come to know about Babbar’s management skills, they decide to invite him to Ramgarh. Clearly the wheel had turned full circle. Unfazed by Thakur's criticism, Babbar decides to challenge Chote Thakur. Anticipating a bitter climax, he anoints Samba as the poll manager of UP. In this cocktail of conflict, flashes of comic relief come from a handful of Soorma Bhopalis, the spokespersons of Thakur from Madhya Pradesh and Stephens. As the reel rolls, the arrival of Babbar looks imminent. Thakur tries to please villagers and throws a few crumbs( gas cylinders, food security etc). But villagers refuse to be treated as beggars. When doles prove ineffective, Thakur begins his search for Jai and Veeru. Guess what? He finds them in Ramgarh. 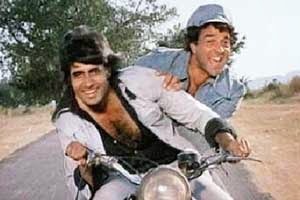 One day, Thakur discovers Jai and Veeru riding their Wagon R in the by lanes of Ramgarh. Dressed in a muffler and sandals, angry young Jai is a rebel with a cause. When he speaks you sense his honesty and integrity. Nothing else matters. His sidekick, Veeru, is a poet known for his poetic prowess. This is when the two leading ladies – Delhi and Amethi, brighten the movie with their presence. Despite striking features, Delhi looks oddly vulnerable. Once a young and sassy woman, Delhi is repeatedly raped as Thakur’s men remain helpless bystanders. Several scars and dark spots have blemished her pretty face. Nevertheless, a cynical Jai is attracted towards Delhi. A tender yet violent romance brews between Delhi and Jai. Unlike the original, characters in this 3D sequel are complicated. Innumerable side stories and dirty stings confuse the audience. And then there is the all pervasive media. Aadhe Thakur ke saath hai, aadhe Babbar ke saath, aur baki Jai-Veeru ke saath. Basically, they are with no one, but their spicy speculative stories. The toll of this bitter conflict is telling on the citizens of Ramgarh. Most of them look like Rahim Chacha– confused and dazed.They are asking, "Itna shor kyon hai bhai?" Well, I had to take a loo break at this point. I just hope that the movie ends on a happy note.But there is no real ending, is there? It is just the place where we stop the story. :) unfortunately, that's how it is. Bahut na-insaafi hai Salim-Javed bhai. Junta pe bhoj daal diya aapne, to end the story? Whether Babbar taking over will be the beginning or end of Ramgarh's fortune - only time will tell. Maybe, hand over their Filmfare award! I have been watching the news since the morning and saying "yeh kya ho raha hai bhai" in very bewildered Rahim Chacha tones ! That phrase sums it up all! LOL...the loo break seems more interesting that the plot that is unfolding. That's a good one Vishaal.Thanks for the share on FB. Hilarious! I enjoyed reading every word . Very brilliant! So good to see you here. Thanks. I was warned by my Khap to not watch this film since it didn't feature the hot new diva known as Gurgaon. Not even an item number! As you know, we only bother with our own kind. Nice satire. I guess we all await the climax! This is funny indeed. Guess we're all waiting how its going to turn out. All is well that ends well. Fingers crossed. Beatiful juxtaposition of current events to a timeless classic. Just like you, the rest of us are also wondering how this particular story will pan out and end. Six months to go. Waiting for a happy ending. But there is no real ending, is there? It is just the place where we wish to end our story. Too much of the same words will seem a bore so I will only say- you blew me away! Jai was never the dramebaaz in the original movie but it looks like he is determined to outshine the original Veeru in this sequel. There are those who think Babbar had better stick to selling tea. As for Chota Thakur, did you know that he has given a contract to a Japanese company to 'build his brand' ? Oh yes. I must add that Dagny. 500 crores to resurrect a brand that is almost impossible to sell. Your presence here makes my day. If you are reading this, I have to tell you I am in awe of your writing skills. Pata nahin what the climax will be. But the stakes are very high for Rahim chachas like us. I am utterly confused. I prefer Babbar to Thankur any day. Poori Sholay ulat pulat ho gayee hai. Nicely written, Alka! Thanks Rachna. When I watch television, I too feel ki sab ulta pulta hai. Now I am wondering about the ending. Hope it is a new and sound beginning. We can't afford a shaky one. I am going to do a Dharna outside your house till you finish the script. I am thinking of a referendum to decide the ending. What say? What a masterpiece! Guess all the Rahim Chachas are waiting for the ending. But will it be a new beginning? Only time will tell. Only time will tell. Thanks Rajrupa. 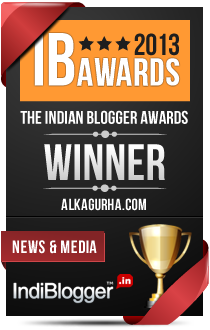 What an imagination, Alka! Time will tell how the cookie crumbles!! Maybe it is because I am all dried up of humour and wit. Or maybe, I have had enough. But this post is rather descriptive and does not add any "D" to the contemporary state of affairs. A post is a reflection of what the author thinks about things, not merely a description of how they are. One can, anyday, map our polity with Mahabharat/Ramayana or any other epic and it would still make sense. But at the end of that exercise, the credit will go to Vyas and Valmiki- not to me who made just made an analogy without trying to get to any ingenious conclusion myself. Thank you for the critique. Appreciate it. I do not claim any credit here either. More often than not, I write because I enjoy expressing and reflecting on issues in a humorous way. True, there are no solutions offered in this post. Alka, I need to be honest. I read it the first time and was a bit confused. probably because of my lack of interest in politics :) But then I re-read it and it all fell into place like pieces of a puzzle. And now, I'm quite convinced. This is one true masterpiece of a script. And love how you've humorously weaved the current political scenario. Brilliant. As for how it all ends, very true, it never ends does it? If does, I sincerely hope it ends well. for the sake of lovely Dilli and the rest of the nation anyway. Appreciate your honesty Sid. I did not give it away in the beginning as some intrigue adds to the charm of any satire. Thank you for spending time. Means a lot. Alka, you should be given to rewrite our history books! Seriously, kids will understand.............if I can understand politics after this, kuch bhi ho sakta hai. I know I have told you before, but seriously, think of a talk show, news channel..........anything where you make this kinda sense to the mango people. First to see you here Vinita and to know that you liked this piece is like 'sone pe suhaga' for me. Muah for sharing. I am so so happy. Not many like political satires. Hope so too. But as they say, expect the unexpected in politics. That is unfair on your part. Entire world is tearing its hair apart in confusion and you walk out of the people's house to go to the loo? A very well crafted sequel to the current Cholle *burp* Sholay, full of p(h)un and sarcastic chilly. I'll also have my moment of fame! If Veeru' s love interest is Amethi, maasi ji could very well be Italian Anshul. Hilarious read, Alka!! You have drawn the parallels so beautifully! Hope the end result is promising for all of us! Hope so too Shilpa. Thank you. You nailed it Alka...This is the most amazing piece of political humor that I read in long time...loved eevery line of it...the post is nothing sort of masterpiece and hee hee that "surma bhopali" reference backed by that picture is "hilll-arious" in itself! Hope you continue writing after your loo break...loved the post! :) Sharing it too! Thank you Ekta. Means a lot. Really happy to see you here. The story will end where we end it, true. And it started because we all pressed the 'vote for AAP' button too. I wish only one thing, only one thing for this country and that is an informed, forward-looking and patient voter, a voter who thinks and one who keeps his own 'city' clean too. You know what I think of your political humour pieces, but this time I confess - if I laughed it was a very uncomfortable laughter. Somewhere, I thought I was laughing at my own self, and at a political milieu that is saddening and scary. However, I am holding on to hope, even if it means AAP making way for another party which cannot but use AAP's mandate as a "benchmark" to win their votes. Something has changed in the system permanently. And this makes me smile! Thank you for grasping the true spirit of the post. Amazing that you always do. A pleasure to be read by someone as accomplished as yourself. Very nice analogy ! 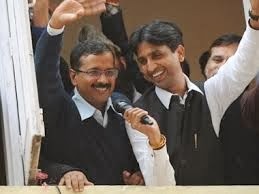 In all these transfer of powers, only lose is Delhi. Lets see what unfolds.. picture abhi baki hai. Marvelous, Alka. My words refuse to appreciate the depth of satire in this interpretation of yours of the 3D Sholey. Yes, we can end the story where we want. The sad part is that we do realize that we are being played, yet we enjoy the play. To be appreciated by you means a lot. Thank you Diwakar. Ha ha...ab kya batayein. Root for stability is all I can say. Good or bad, at least we will get out of the policy paralysis zone. Found the above scenario very amusing and loved how you compared them with this mega hit movie.